As the economy called for additional capital from 1948 to 1981 to increase its economic value sick as through growth of the GNP,. 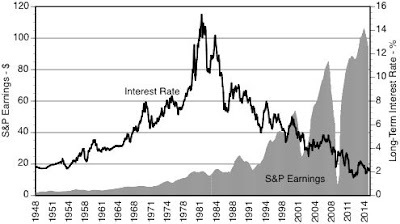 When the earnings started declining, the prevailing interest rate were also reduced as capital was shifted from promoting growth of the economy to a more profitable incomes that could be generated from financial transactions. To stimulate growth in the period after 1981 financial institutions shifted to greater emphasis on debt instead of relying on equity investments to finance U.S. growth. Much of the emphasis on debt was also a consequence of a reduction in interest rates engineered by the Federal Reserve and the U.S. Treasury. After year 2000 it was the government stimulated stock market, based on debt that supported the rise in stock market speculation after year 2000. The projected rise in the interest rates announced by the Federal Reserve should be seen as a sign that the end of an era of "cheap" money also signals an end of excessive Price/Earning ratios that have prevailed on the stock market.